A report of domestic violence at a Mira Mesa home led Tuesday to a brief police standoff that ended when an apparent natural gas explosion occurred inside a backyard shed, after which the suspected abuser emerged from the scorched outbuilding and surrendered. Photo via OnScene.TV. 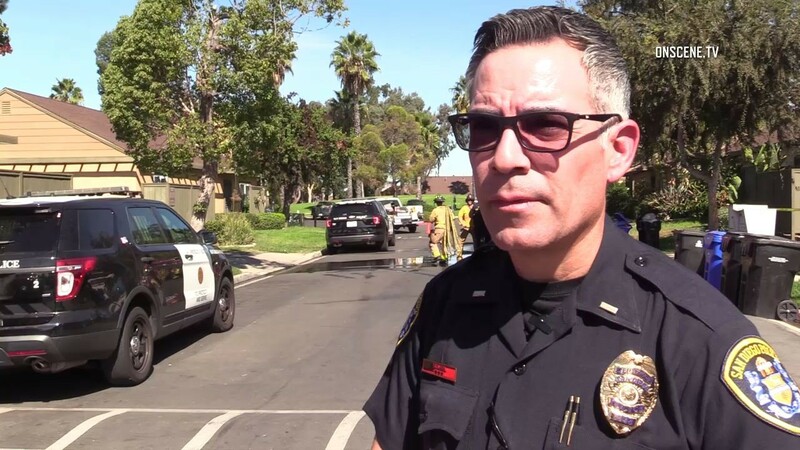 A report of domestic violence at a Mira Mesa home led Tuesday to a brief police standoff that ended when an apparent natural gas explosion occurred inside a backyard shed, after which the suspected abuser emerged from the scorched outbuilding and surrendered. The suspect’s girlfriend made a 911 call about 9:45 a.m. to report the alleged physical abuse in the 10000 block of Caminito Obra, according to San Diego Police. When patrol personnel arrived, the woman told them her boyfriend had locked himself inside an auxiliary storage structure behind the house and opened a natural gas line. The man, whose name was not immediately available, remained holed up in the shed until shortly after 10:30 a.m., when a blast sounded from inside it. He then came out and was taken into custody, Officer Billy Hernandez said. Medics took the suspect to a hospital for an evaluation. Firefighters quickly extinguished a small blaze that resulted from the explosion. It was unclear if the woman suffered any injuries during the episode, Hernandez said.